Tonight we are holding a very special service. At the request of Bishop Andrew we are hosting a vocation service. It will be the first of several that will be held across the Diocese. So we are piloting the initiative. Friends from the neighbouring churches will join us to learn about Christian vocations. Bishop Andrew will be preaching. William Challis, the Director of Ordinands – that is those in training to be ordained, will interview Jennifer the new curate at Egham, and also Peter and Will. They will share how they discerned God’s call to ministry. Please come, welcome our friends from other churches and the university. But be prepared as well. Be prepared for God to speak to you too about his call in your life. I just feel a little guilty because there is one important thing we omitted from the publicity. There is no health warning. Seeking ordination could seriously shorten your life. It will likely bring heartache, misunderstanding, and disagreements. And that is just from friends and family before you have even begun training. You will join many others on Satan’s hit list. He will do everything he can to make you pay. He will most certainly hinder, harass and hound you. He will distract, divert and denigrate you. He will try and corrupt, compromise and maybe even kill you, if he can. That is why we are also delighted to be hosting a half-day regional conference for the Barnabas Fund on Saturday 14th November. The focus will be on the suffering church and how we can support them. Tell your friends. “Honoured father, brother, and sisters… the account of my father’s leg growing worse and worse concerns me; but what can I do? I look to my God and my father’s God… You advise me to return home. I thank you for your good intentions; may the Lord bless you for them. But I have no inclination to do so; having set my hand to the plough, I would not look back. It hath pleased the Lord to prosper me so far, and grant me favour in the eyes of this people”. “He (the missionary) should endure hardness as a good soldier of Jesus Christ. To complain of difficulties inseparably connected with the work, is unworthy of him.” Robert died in 1834 aged 52. What did he achieve? In 27 years in China, Robert baptised just 10 believers – about one every 3 years. Was the pain and suffering worth it? It is all about ones perspective isn’t it? Its about ones priorities too. “Whoever wants to be my disciple must deny themselves and take up their cross and follow me. For whoever wants to save their life will lose it, but whoever loses their life for me and for the gospel will save it.” (Mark 834-35). Picture the scene. “The whole town gathered at the door”. Hundreds if not a few thousand were gathering around Peter’s home. The noise and commotion must have reached a pitch as people jostled to get near the door. Why did people wait till after dark to come? Because it had been the Sabbath. The day began at 6:00am and ended at 6:00pm. The Sabbath was considered over when three stars were visible in the sky. So when the sun had set, the people carried their sick and suffering relatives to meet Jesus. Jesus appears from the door, it is getting dark. It must have been a pitiful scene. Jesus is surrounded by the sick and dying. The whole town is there. Jesus has compassion on them and heals many, one person at a time. He drives out many demons too, refusing to allow them to reveal who he was. It is by now late into the night and at some point Jesus retires, exhausted. Many go home reluctantly, disappointed or perhaps camp out nearby. The desperate ones will be back at dawn. What do you expect Jesus to do? What were his priorities? Remember Jesus had got to bed late. The evening surgery had began after dark, yet Mark tells us Jesus got up while it was still dark, left his warm bed, and went out to a cold solitary place to pray to the Father. We don’t know what he prayed. What is more instructive is the fact that he got up in the early morning while it was still dark, and found a place to be alone to talk to the Father. If Jesus needed to do it, how much more …. do we. Free from distractions, like the phone, emails, Twitter, Facebook and the needs of those around us. Can you cope with that? Being alone with God? In silence? When I was single and I lived alone I was very punctual at having a quiet time before breakfast. Then there was a 25 year interlude called family. Now I have to use my Fitbit to vibrate to remind me when to go to bed (10:30pm) and when to wake up (6:30am) to have my quiet time. We are all wired differently. But there is nothing more important than to cultivate our personal relationship with God the Father, in times of solitude, with an open Bible, in prayer. Because as God’s word is read, God’s voice is heard. When better, than at the beginning of the day? I know that if I don’t make time before I begin my day, I will never find the time afterward. And the precious opportunity to commune with him is lost. Like Jesus, make it your first priority. One might have expected that after a night of prayer, Jesus would have been a little more compassionate toward the crowds of sick and dying gathering in the village below. But no, the disciples were in for a shock. A rude awakening. Gently but firmly Jesus explains the agenda for the day. Jesus wasn’t going back to heal the rest. It was time to move on. Jesus would not be deflected from his priorities. Notice Jesus says “Let us go”. This was a group training exercise. Training the disciples played a vital part of Jesus ministry. That is why he invested so much time in them away from the crowds. He took time to explain his actions, explain his parables, show them how to trust God for their provision. How to reproduce themselves. Succession planning played a significant part of Jesus three-year ministry. If this interests you, listen in to Premier Radio this afternoon at 3:00pm. Andy Peck and I are continuing our succession planning from last week’s programme. Church leaders often handle succession planning badly. We would do well to learn from Jesus. Jesus knew it would only be as His disciples embraced and then passed on his priorities to others would the whole world hear the gospel. The word “Christian” has been devalued. I prefer “Christ follower” A Christian is a disciple of Jesus, a follower, a learner. Maturity does not come by accumulating more and more knowledge about God. Maturity comes by reproducing yourself. Becoming a spiritual parent. Learning from those more mature, sharing with those spiritually younger. Jesus came to fulfil what the Scriptures foretold. To show God’s word was coming true. Jesus cast out demons because they stood in the way of people hearing and responding to that message. Jesus healed the sick and raised the dead to authenticate his claims to be the Messiah, just as the scriptures had predicted. His miracles of healing and deliverance caused great interest but they were not his priority. In fact often the miracles got in the way because people began to come to him for the wrong reasons. Jesus didn’t use healings as a means of evangelism. What does he say to the healed leper in 1:43? “Don’t tell anyone.” What does he say to the evil spirit in 1:25? “Be quiet” Again in 1:34 he wouldn’t let the demons speak, because they knew who he was…. Jesus knew who he was, the demons knew who he was, but the people didn’t yet understand what kind of Saviour he would be. Jesus would not to let the demons lead people astray. Why had Jesus come? “Let us go somewhere else—to the nearby villages—so I can preach there also. That is why I have come.” (Mark 1:38). Jesus came to teach and fulfil God’s word because it reveals God’s will. Through scripture, Jesus led people back into a right relationship with God. He came to call people to repent of their sin and trust in Him. He came to die in our place, to ransom us, to redeem us, to reconcile us to God all in fulfilment of the scriptures. And when Jesus was crucified, how many followers did he have? What had he achieved? He left behind only a handful of disciples, entrusting them with responsibility for what? “Go into all the world, making disciples of all nations, teaching them to obey everything I have commanded you” (Matthew 28:18-20). Jesus commanded them to take the gospel to the entire world by reproducing themselves. Think about the enormity of that. That is why we are here. That is why Robert Morrison went to China. What did he accomplish? In 27 years of ministry, he baptised just 10 new disciples. Not many – but enough. Because he was a pioneer. The first Protestant missionary to China. He translated the entire Bible into Chinese. He founded the first theological college in China, the Anglo-Chinese College in Malacca. By the time he died in 1834, through his efforts, China possessed a Bible; a grammar of the Chinese language; translations of the Book of Common Prayer and other Christian texts; many shorter works on Chinese history, culture, literature; a history of Christian missions among the Chinese; a vocabulary of the Cantonese dialect; and a handful of indigenous disciples trained and dedicated to proclaiming the good news. Robert established the foundation of the evangelical Church in China. A Church that survived the Boxer Revolution when all foreign missionaries were either killed or expelled. A church that survived the Japanese invasion and internment camps during the Second World War. A church that multiplied under Communist persecution. 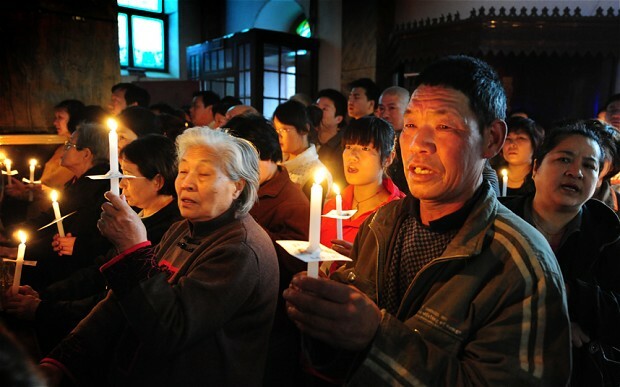 A church today of more than 67 million members – larger indeed than the Communist Party. A church that has not only survived, but flourished, against which the gates of hell cannot stand. Jesus Priorities were really very simple: Build, Send, Win. Talking with God the Father, training the disciples for mission, and telling people how to enter the Kingdom of God. Win – Build – Send. These were the priorities of Jesus. And by God’s grace, may they remain ours too. Let us pray. This entry was posted in Bible, Sermons, Theology on October 10, 2015 by Stephen Sizer.